Stew didn’t win the Bafta, Graham Norton did. But Stew didn’t care. Only just discovered Joey Diaz. Google Joey Diaz and Trump. If Trump wins, Joey will be on the first Cuban deported to Havana. Is that the stuff from a while back about the Mafia links, and the dodgy deals? Caught Steve Hughes again last month, absolute legend! It’s dark even for him, and more than that, it was originally recorded on sept 10, 2001. Worth a listen if you were a fan, and Kudos to his daughter Kelly for getting it released. WARNING:It’s the unedited version and very rude at times. 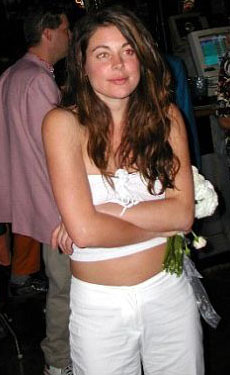 PS Like the story, Renee is real, here’s a picture of her from way back when looking gorgeous and unimpressed (and high as a kite on ecstacy and champers, if you believe Doug) on the night of her ersatz Vegas wedding…to Doug, but that’s another horror story. PPS I reckon that’s Trav Colyer’s double to the left of Doug in the clip. Have you seen his new special that’s on Seeso? I haven’t been able to find a copy as of yet. Also, Rogan’s new special just hit Netflix, I’ll give it watch this evening. Yes, it was up on YouTube, probably briefly before they pulled it down . Good but not as good as the last one. FYI there are $24 tickets to a bunch of shows at this year’s comedy festival available until 10am tomorrow. Seems like it’s mostly weeknights. Just watched about 2 hours of Jimmy Carr on the Comedy Channel. I don't there are any lines he won't cross. ■■■■, he's funny. Saw him at Hamer Hall last month. Didn’t know a lot about him, but Christ I laughed a lot, and laughed a lot again. His newer netflix was a tad underwhelming. It’s another slim line up for international acts. It’s a year to go all Aussie I reckon. Been meaning to give a shout out to Mike Bribiglia for his latest Netflix special. Very, very funny guy, although he is a story teller rather than a straight up joke teller. Neal Brennan ‘3 mics’ is also good for something different, and I really liked Michael Che’s special. Sadly (very sadly), Bill Burr’s new special was, well, rubbish. Seen both Mike and Bill live. Really enjoyed Birbiglia style of story telling. You leave his gig feeling like you’ve learnt something about life whilst having a laugh. Looking forward to his new special. Bill Burr made me laugh so hard I was concerned for my health. I have to agree though, his last special was really disappointing. The new HBO series “Crashing” has been pretty good so far. Starring comedian Pete Holmes with plenty of cameos throughout the backdrop of a comedian trying to establish himself. Chappelle netflix special coming soon. Chris Rock is coming here in late June. l hear that Billy Connolly is suffering from the onset of Alzheimer’s and cancer, but l didn’t catch what form of cancer. Sad it true.